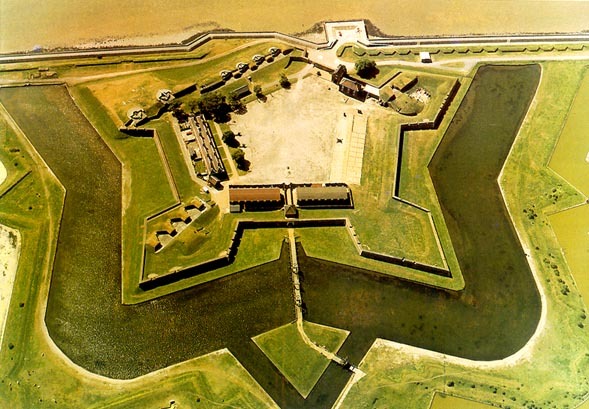 The original fort at Tilbury was begun in the reign of Henry VIII. The present building was built between 1670 and 1683 with a magnificent gatehouse facing the river Thames. The fort was used to hold Scottish prisoners following the Jacobite rebellion in 1745 led by Bonnie Prince Charlie - see Panorama 15. Panorama 32 contains an article describing some excavations on the site. The use of Tilbury Fort in the second WorldWar was briefly mentioned at our October 2001 meeting - click here. This picture is from "Essex from the Air". It is copyright Essex County Council and may not be used without permission.